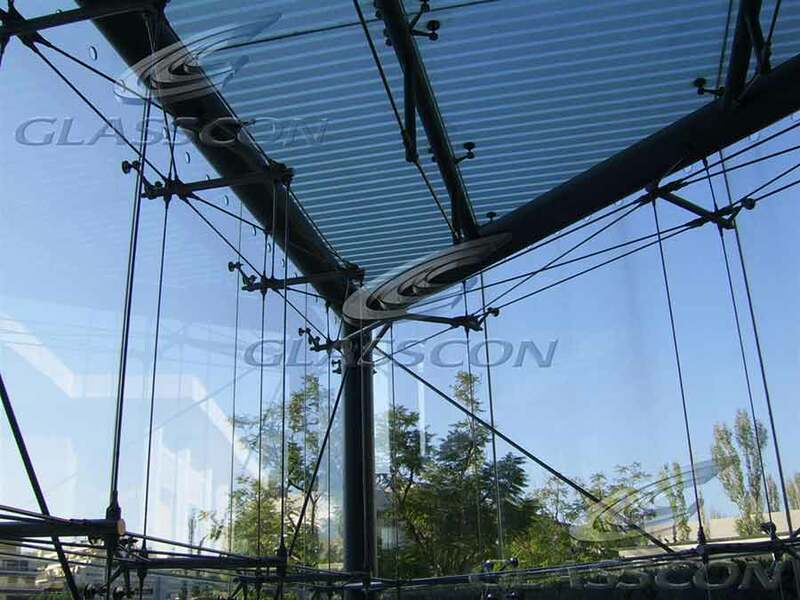 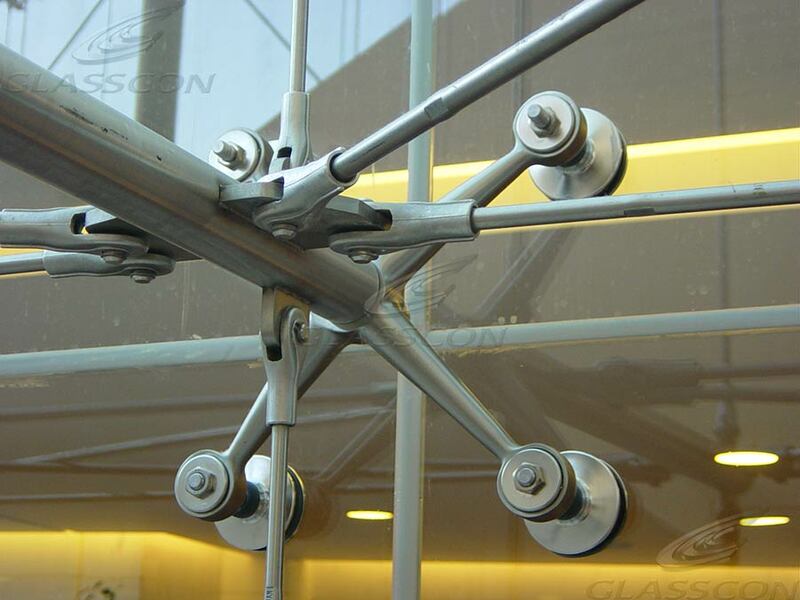 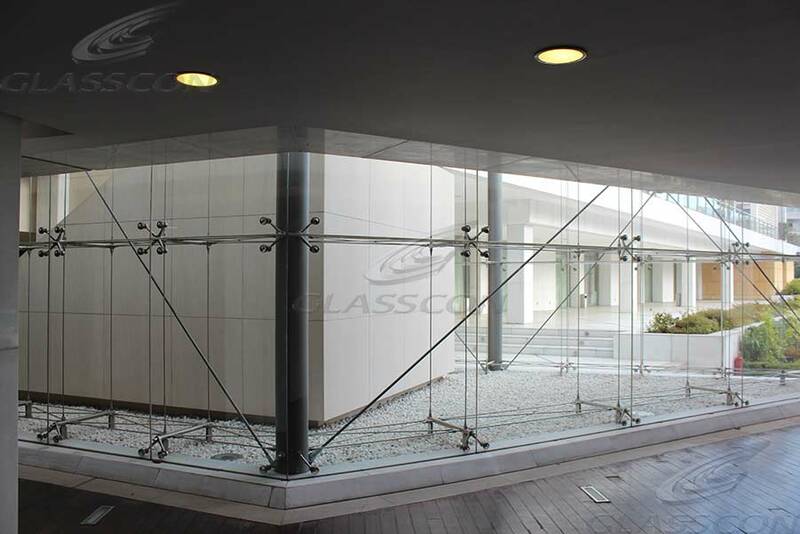 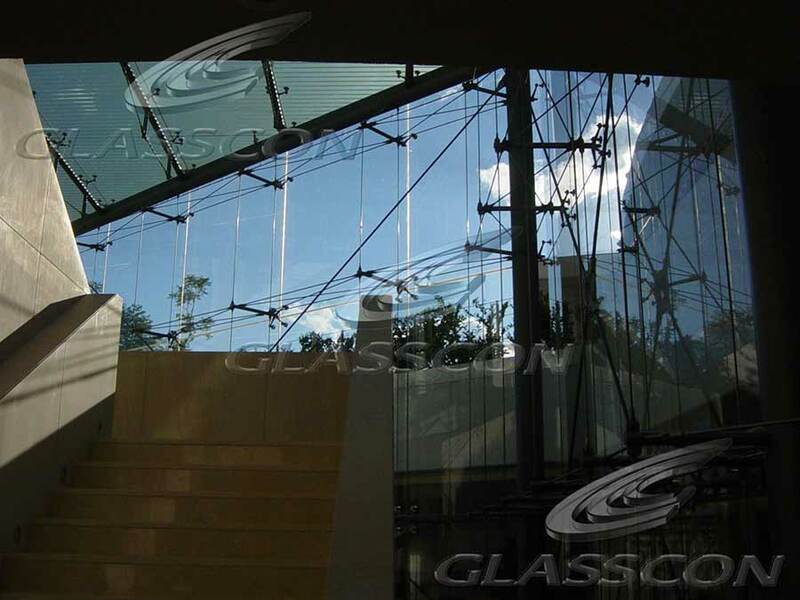 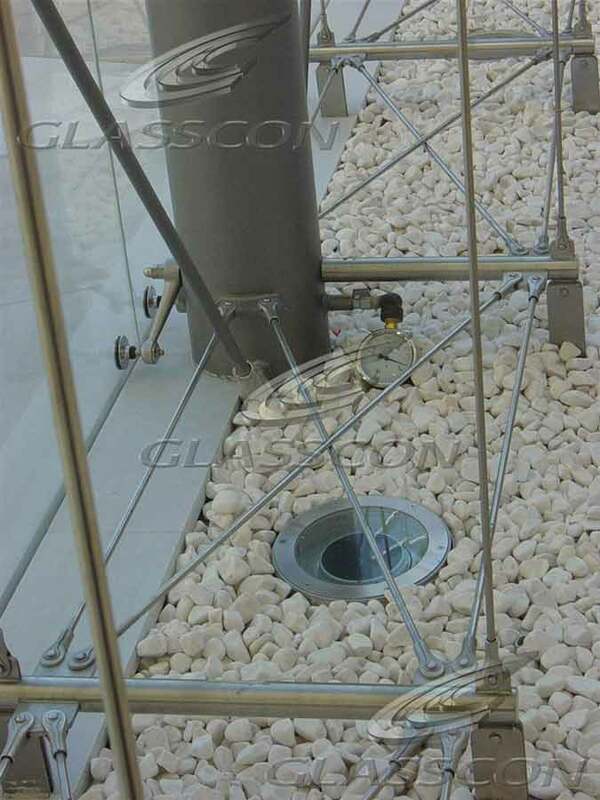 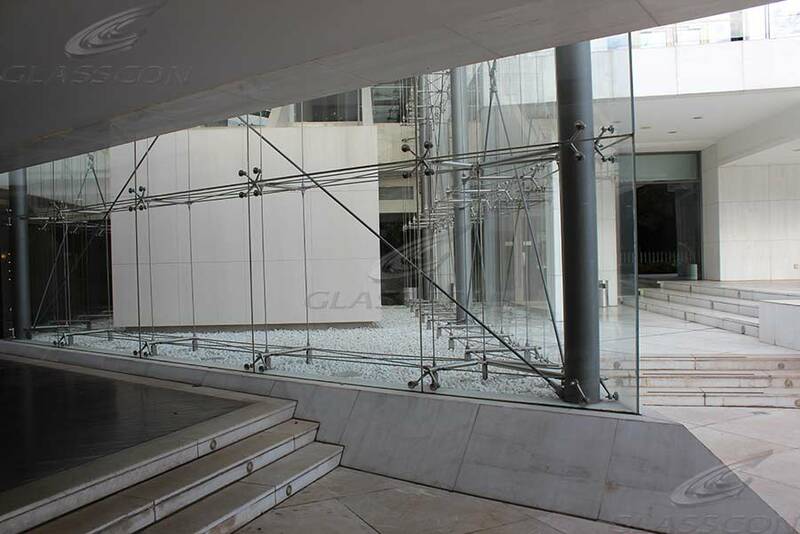 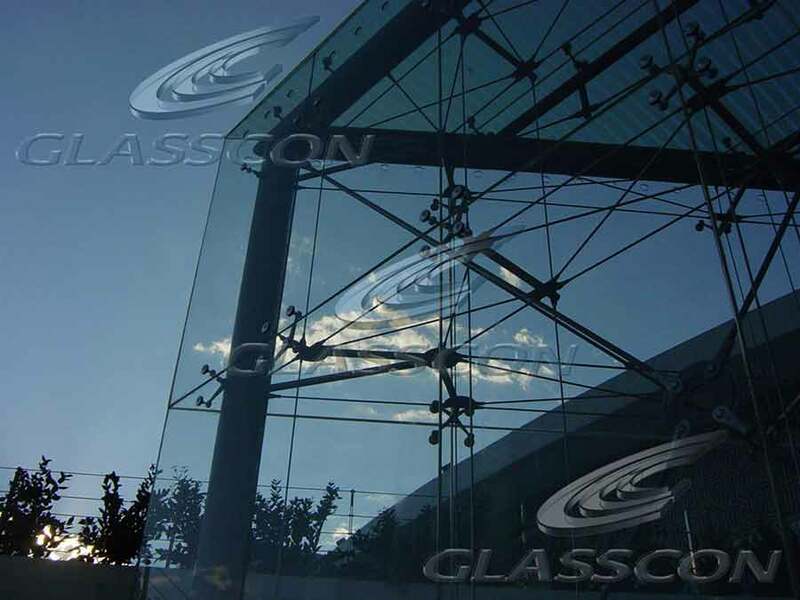 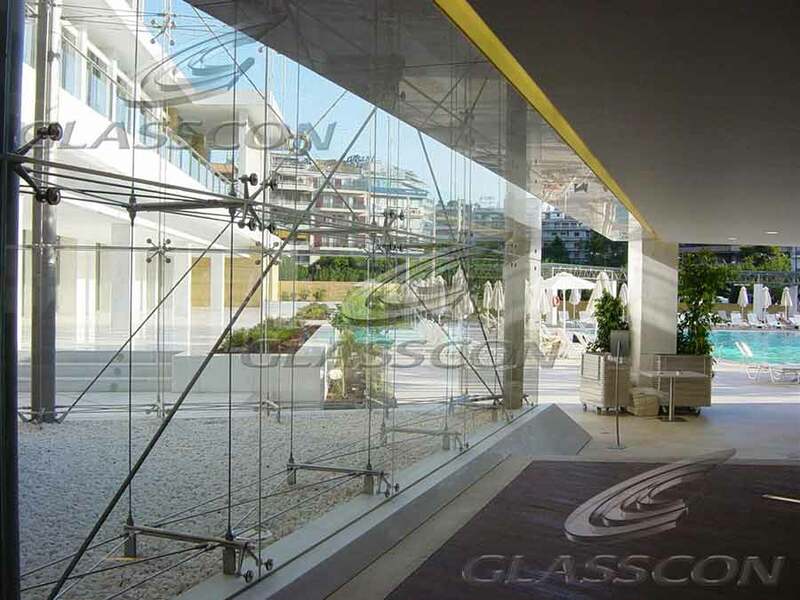 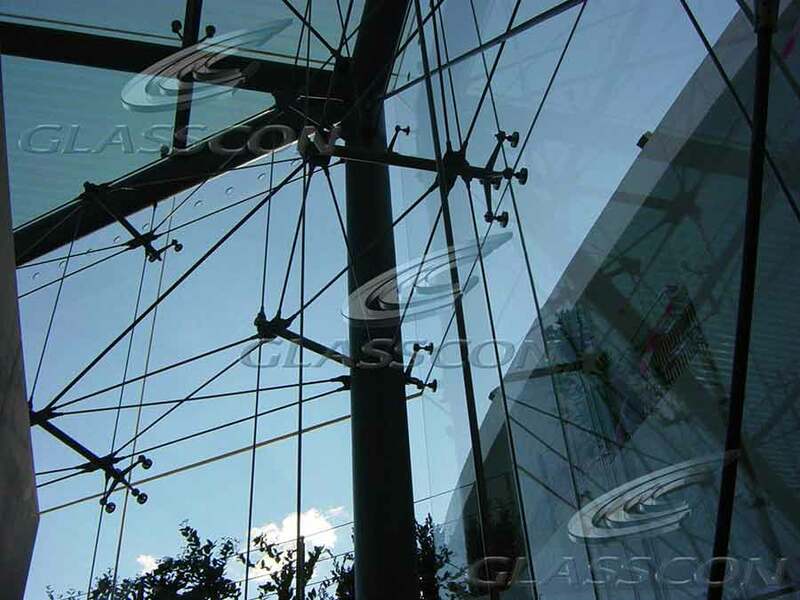 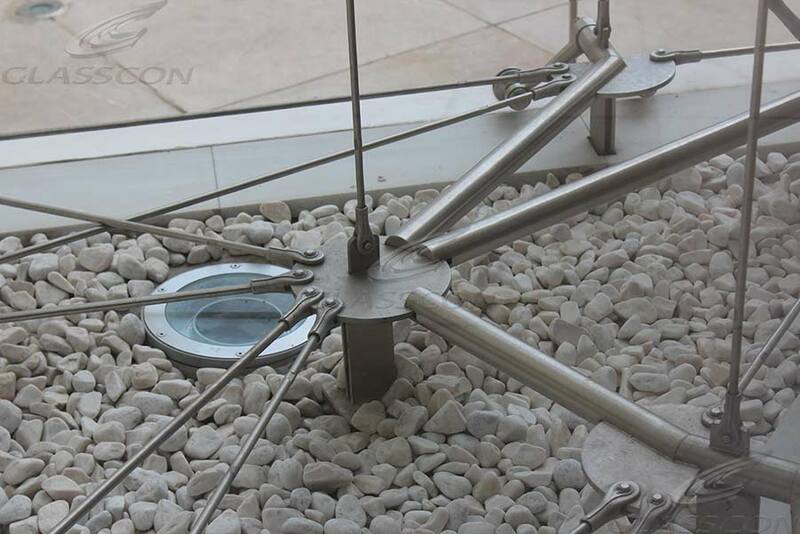 GLASSCON designed and constructed a high-tech staircase glass envelope. 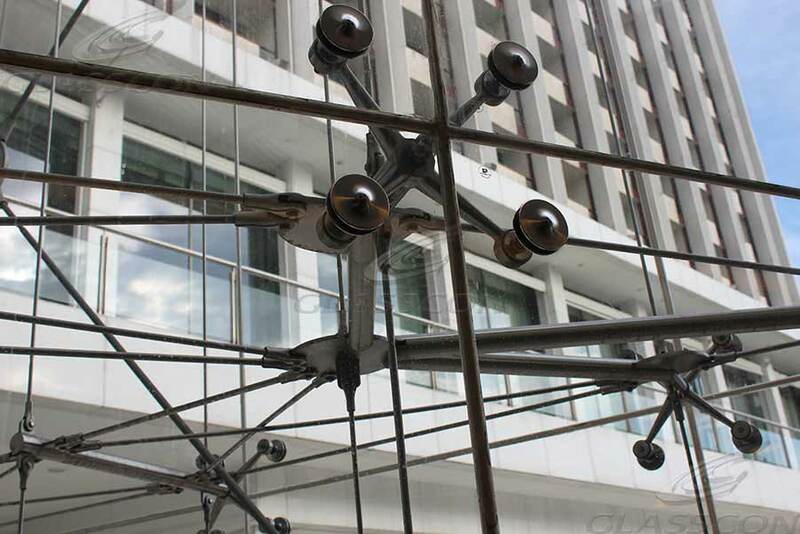 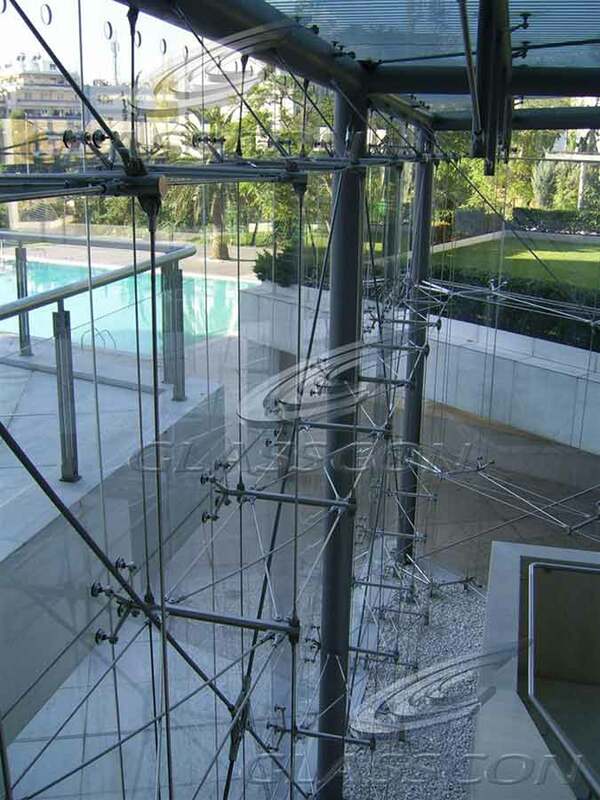 The structure has a height of more than 12 m., is supported on a suspended 3D - stainless steel TENSION ROD SYSTEM, inox pressure bars & bolted fittings. 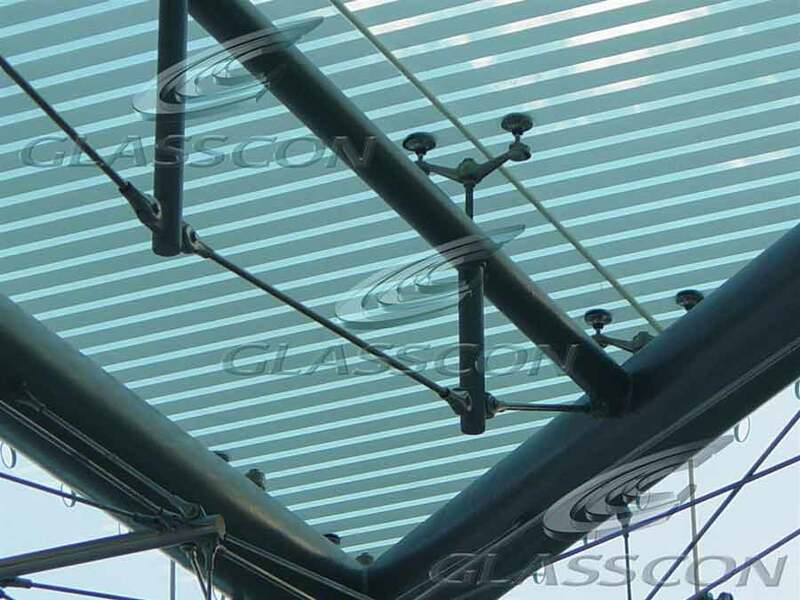 Digital print is applied on the glass canopy, in order to provide shading. 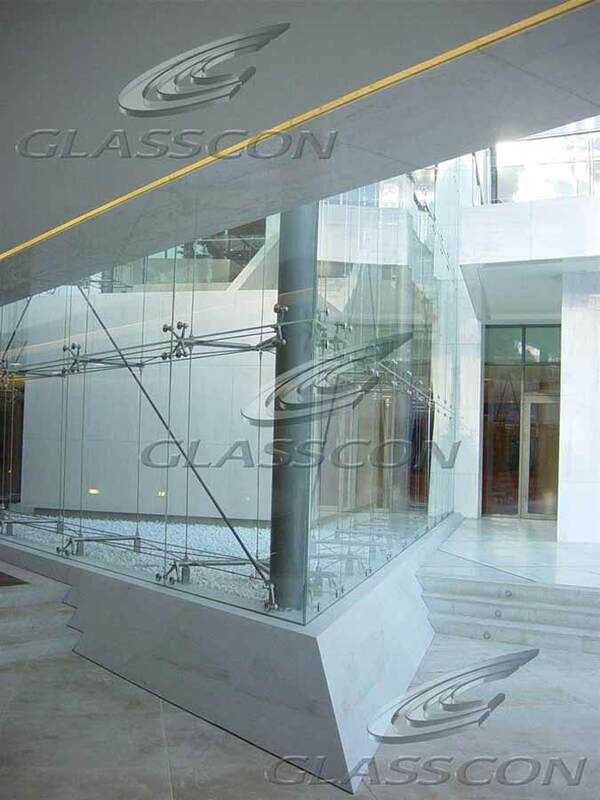 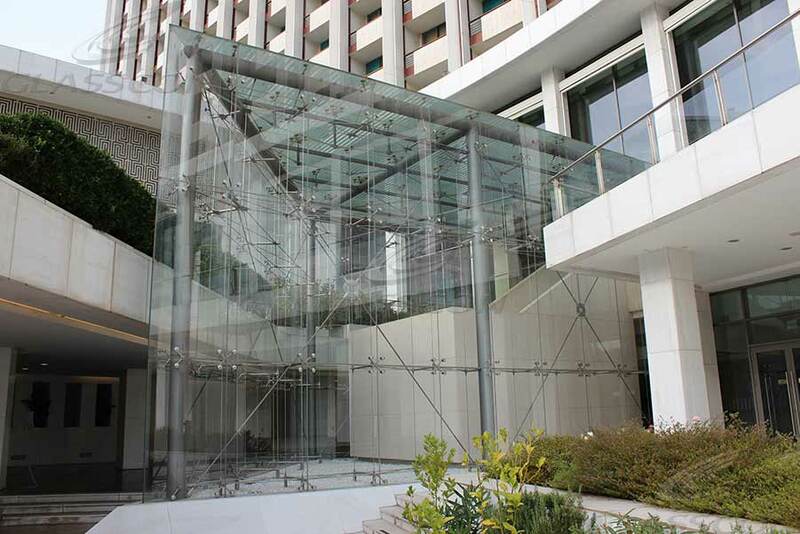 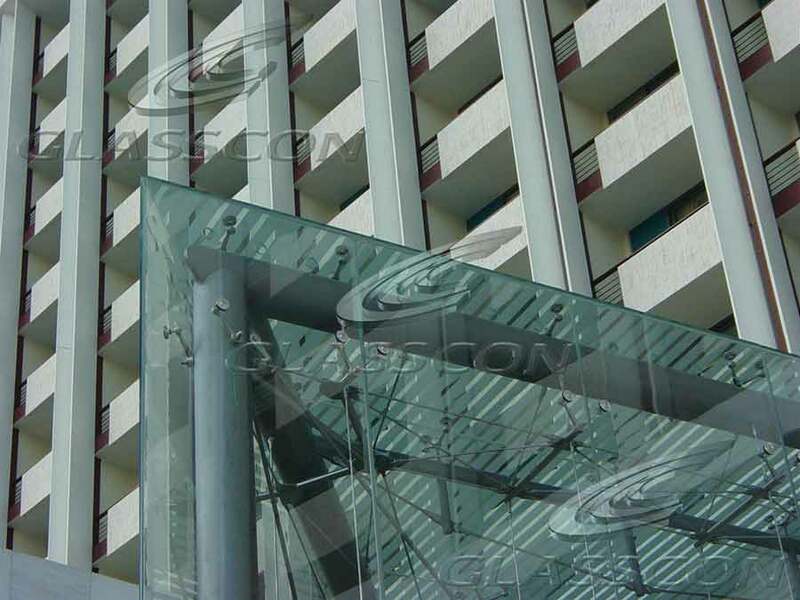 GLASSCON designed and constructed a high-tech staircase canopy in a luxurious hotel.The structure contains a 3D stainless steel space frame and point fixed fittings planar and spider.The canopy is over 10 meters high.The glass panels of the roof have been treated with silkprinting in order to provide shading. 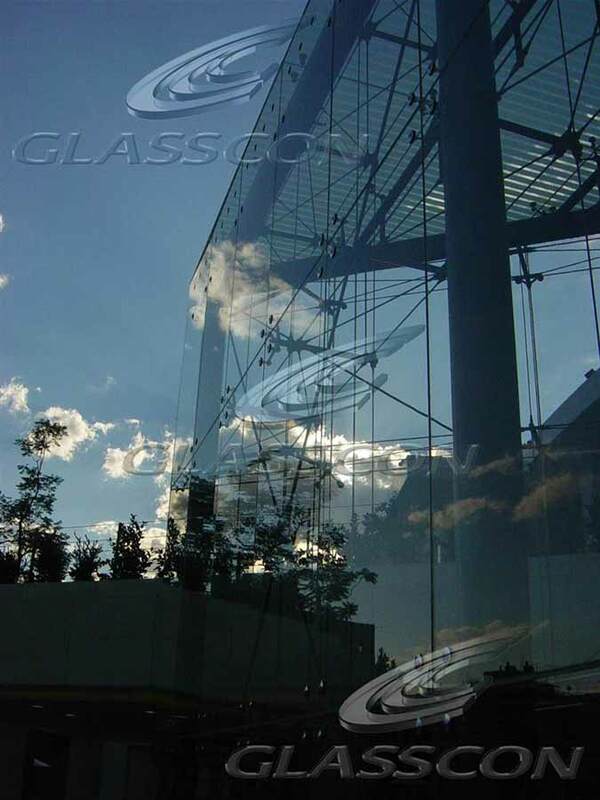 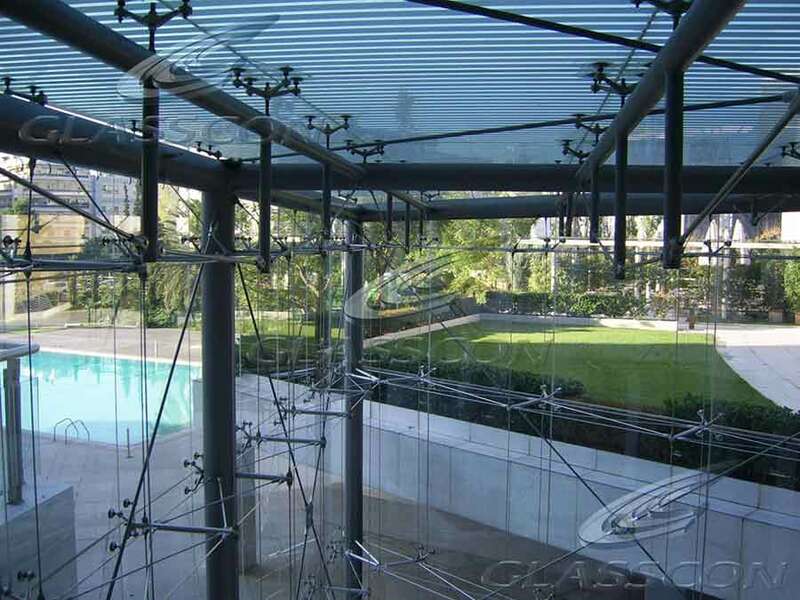 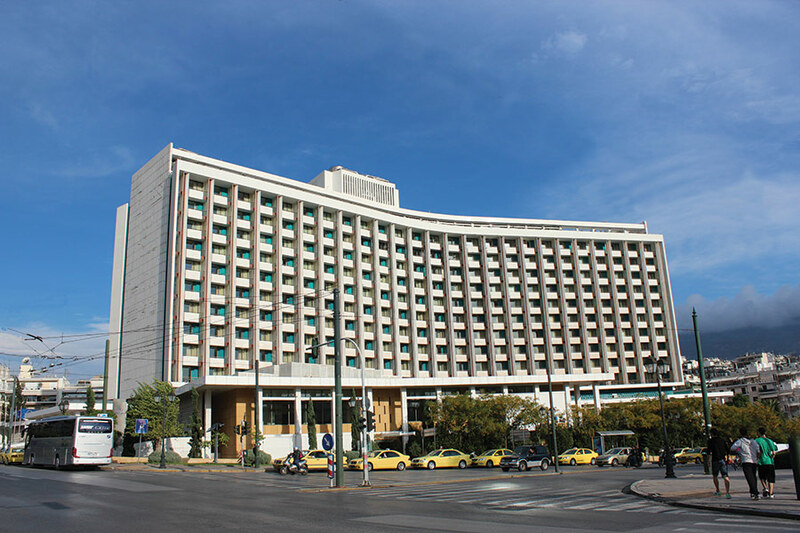 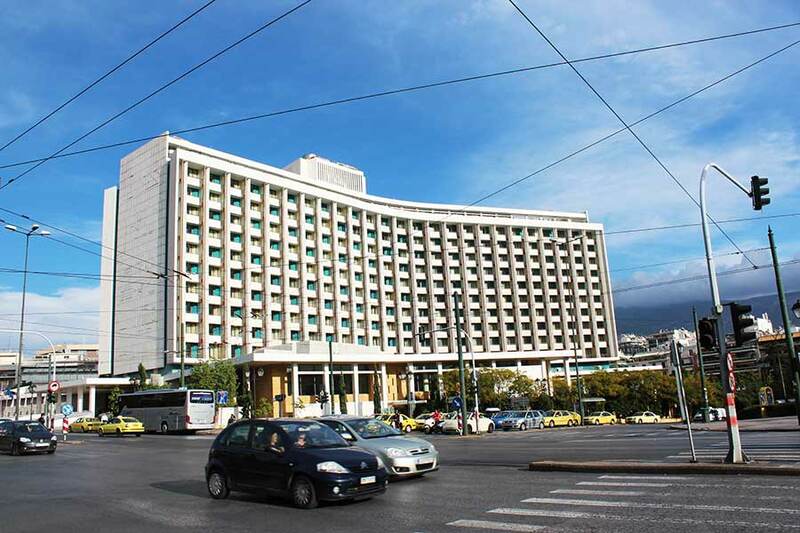 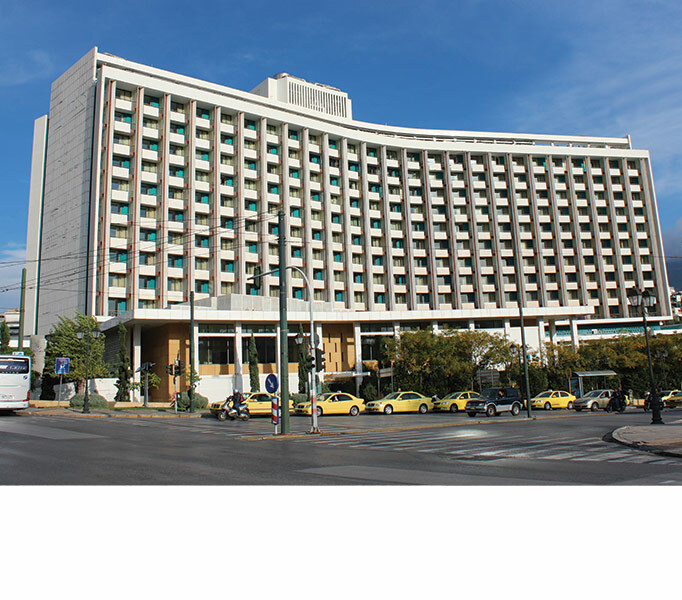 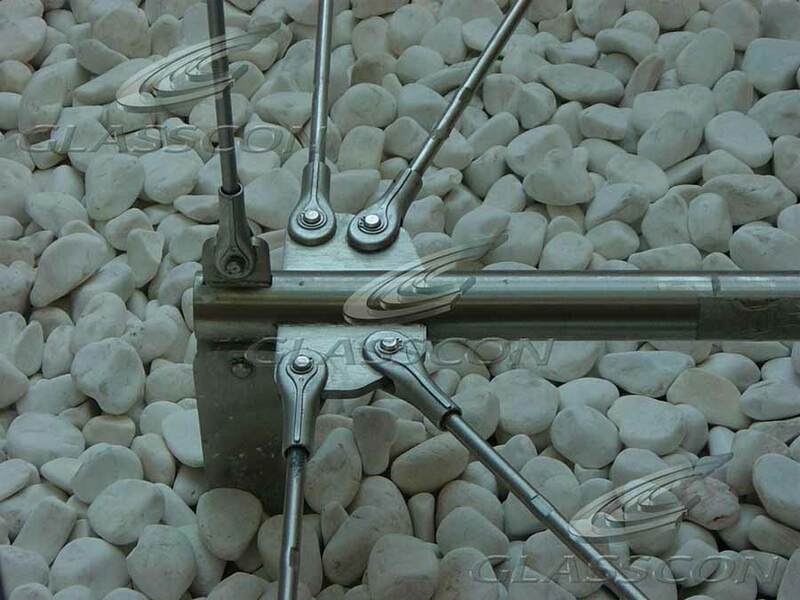 Regarding the GLASS CURTAIN WALLS with pre-stressed CABLES & TENSION ROD, these are glass curtain walls that are suspended from MINIMAL STAINLESS STEEL TENSION RODS or INOX PRESTRESSED CABLES. 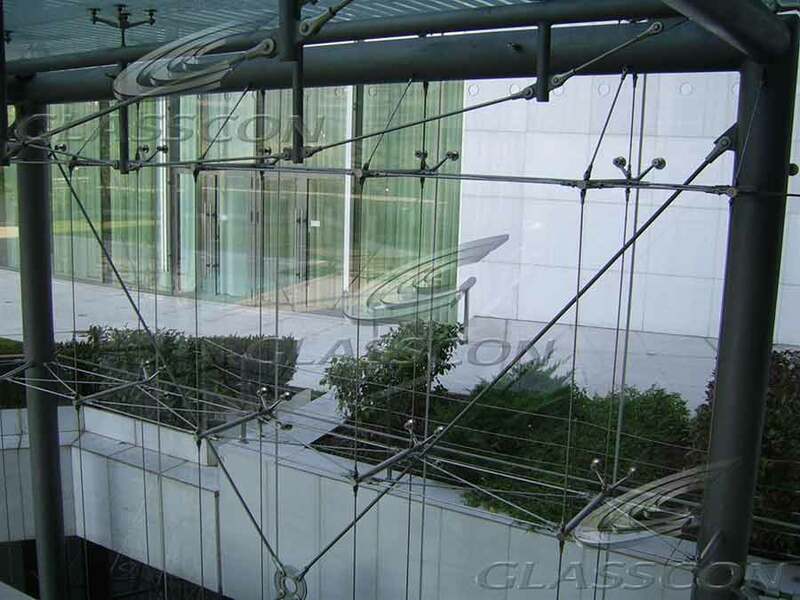 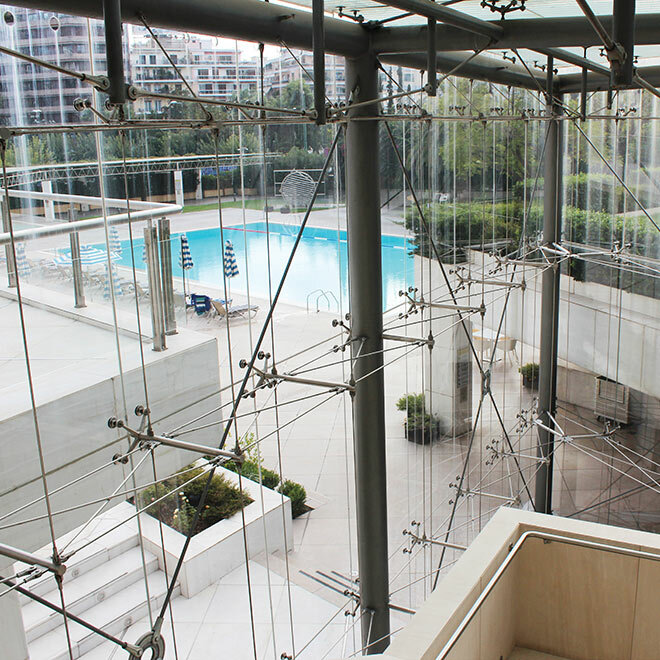 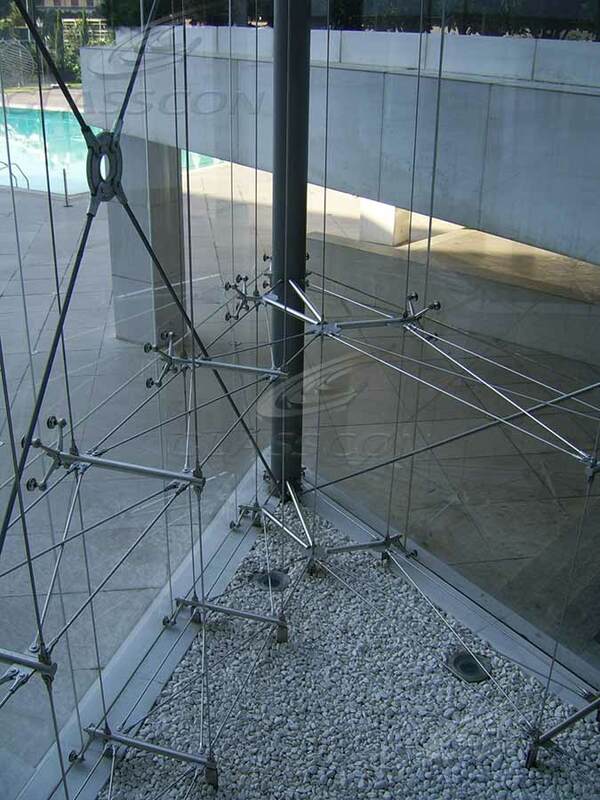 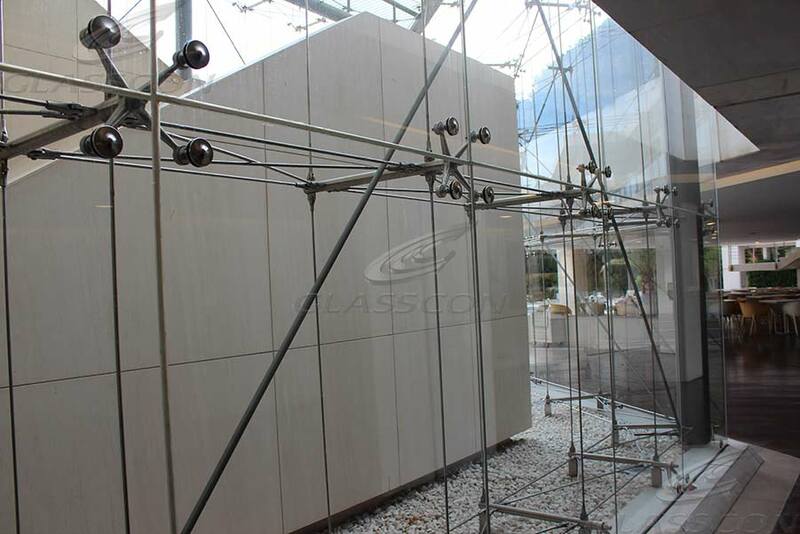 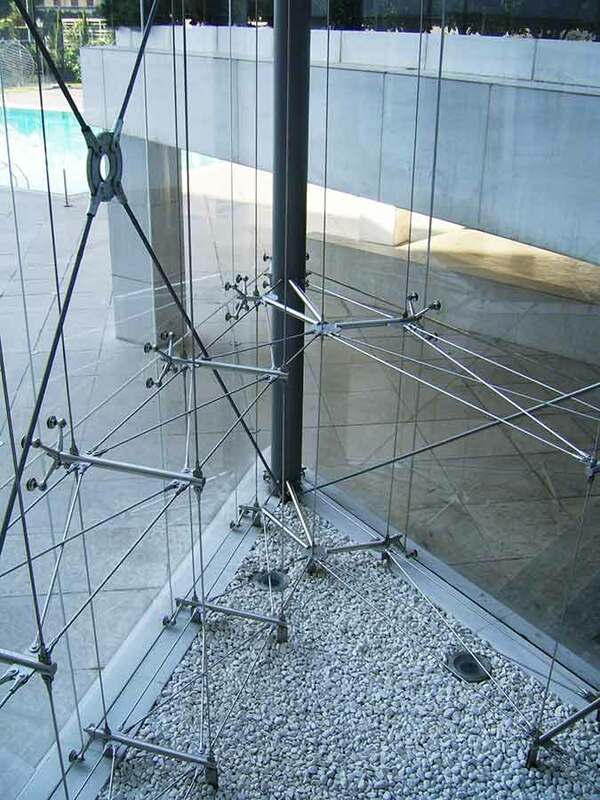 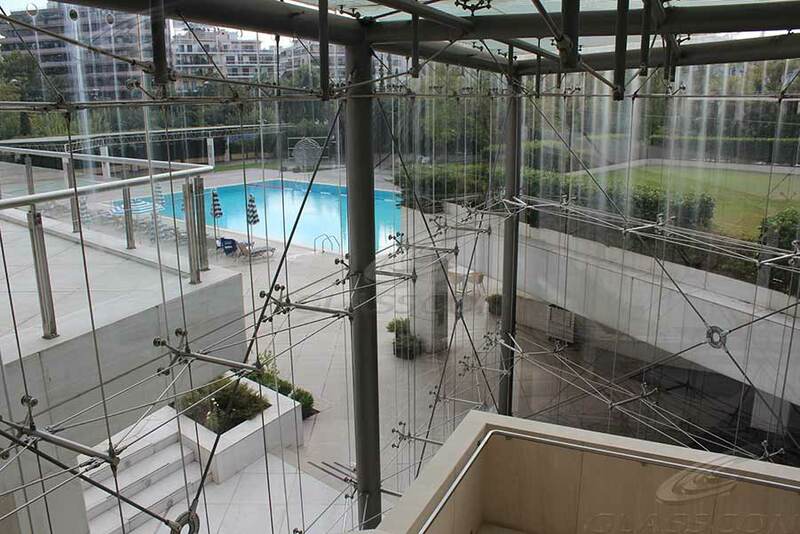 The SUSPENDED GLASS CURTAIN WALLS with CABLES & TENSION ROD is supposed to be the most '' LIGHT-WEIGHT, IMPRESSIVE and SUSPENDED CURTAIN WALL SYSTEM '', almost invisible to the eye, because they don't have any MASSIV steel or concrete substructure and they are completely FRAMELESS.